With Media and TV coverage. 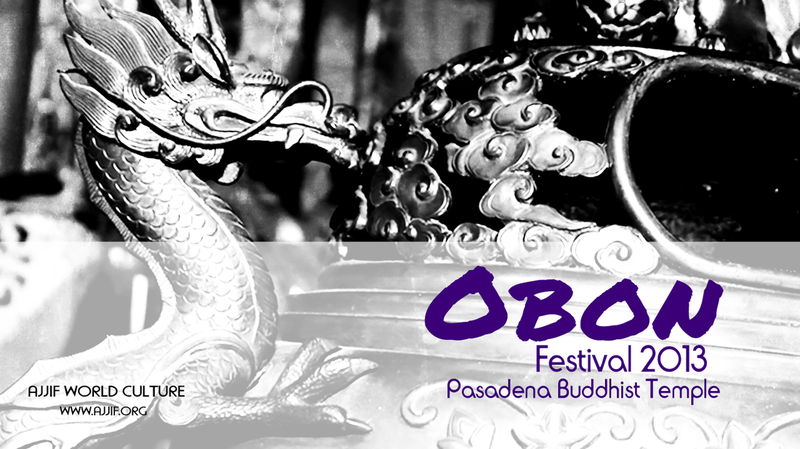 Supported by the Japanese Community of Los Angeles. Organized and Hosted by AJJIF USA. Sanctioned by AJJIF GLOBAL - ALL JAPAN JU-JITSU INTERNATIONAL FEDERATION and KATABAMI JU-JITSU CLAN. 2nd. 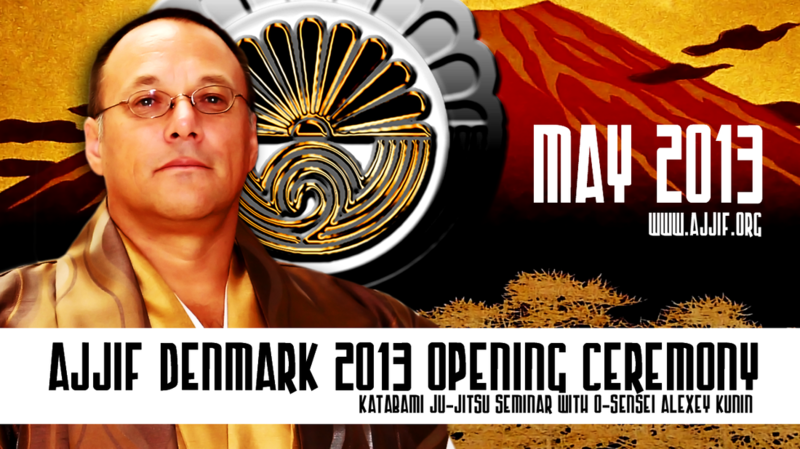 Japanese Budo Festival and Seminar of Traditional Japanese Ju-Jitsu - Katabami Ryu Ju-Jitsu ( Ancient Samurai Clan ), Judo, Okinawa Karate ( Shorinjiryu ) and Kenjutsu. With Media and TV coverage. Supported by the Japanese Community of Los Angeles. Organized and Hosted by AJJIF USA. Sanctioned by AJJIF GLOBAL - ALL JAPAN JU-JITSU INTERNATIONAL FEDERATION and KATABAMI JU-JITSU CLAN. International﻿ Katabami Ju-Jitsu Seminar with O-Sensei Alexey Kunin 10 Dan Ju-Jitsu ( USA ), Founder & Head of the AJJIF GLOBAL, Headmaster / Head Family of Katabami Ju-Jitsu Clan, Hanshi Yury Smirnov 8 Dan Ju-Jitsu, AJJIF Director of Eurasia, AJJIF Representative ( Russia ), President of IMAF EURASIA, Member of Katabami Ju-Jitsu Clan, Shihan Ionel Bara 8 Dan Okinawa Karate, AJJIF Vice President, President of WTFSKF, Member of Katabami Ju-Jitsu Clan, Shihan Michael Bock 7 Dan Shotokan Karate, AJJIF Representative ( Germany ), President of German Martial Arts Organization, Member of Katabami Ju-Jitsu Clan, Shihan Dariusz Bajkovski 7 Dan Fudokan Karate, AJJIF Representative ( Poland ), President of Polish Karate Association. With International & National TV and Press & Media Complete Coverage. With the support of the European and Polish Government, State and City Officials. Under the Honorary Patronage of the President of Republic of Poland Bronisław Komorowski, AJJIF Member ( Poland ), President Ec. Emil Duma, Head of Superior Council, Chamber of Commerce and Industry Romania - Switzerland, AJJIF Member ( Romania ), Vice President Mariana Tisea, Chamber of Commerce and Industry Romania - Switzerland, AJJIF Member ( Romania ). 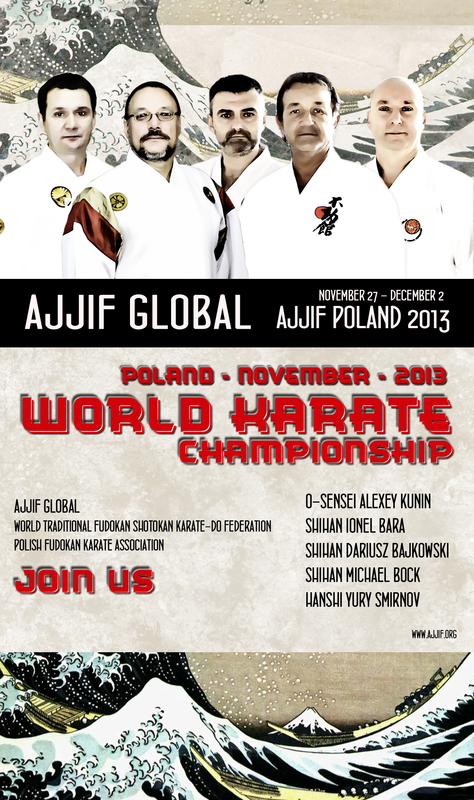 Organized and Hosted by WTFSKF ( World Karate Governing Body ) and AJJIF POLAND. Sanctioned by AJJIF GLOBAL - ALL JAPAN JU-JITSU INTERNATIONAL FEDERATION and KATABAMI JU-JITSU CLAN. O-Sensei Alexey Kunin 10 Dan Ju-Jitsu ( USA ), Founder & Head of the AJJIF GLOBAL, Headmaster / Head Family of Katabami Ju-Jitsu Clan, Hanshi Toney Raven 10 Dan Ju-Jitsu, 10 Dan Judo, AJJIF Senior Vice President, Member of Katabami Ju-Jitsu Clan, Shihan Tony Calvino 8 Dan Karate, 7 Dan Ju-Jitsu, AJJIF Representative ( Cuba ), Member of Katabami Ju-Jitsu Clan, Shihan Boris Brezhnev, AJJIF Sambo Representative ( USA ), Vice President of American Amateur Sambo Federation. Organized and Hosted by AJJIF USA. Sanctioned by AJJIF GLOBAL - ALL JAPAN JU-JITSU INTERNATIONAL FEDERATION and KATABAMI JU-JITSU CLAN. O-Sensei Alexey Kunin 10 Dan Ju-Jitsu ( USA ), Founder & President of the AJJIF GLOBAL, Headmaster / Head Family of Katabami Ju-Jitsu Clan, Hanshi Yury Smirnov 8 Dan Ju-Jitsu, AJJIF Director of Eurasia, AJJIF Representative ( Russia ), President of IMAF EURASIA, Member of Katabami Ju-Jitsu Clan, Shihan Anthony Calvino 8 Dan Karate, AJJIF Representative ( Cuba ), Member of Katabami Ju-Jitsu Clan, Sensei Ahmad Alatroozi 4 Dan Shidokan-Jitsu, AJJIF Representative ( Kuwait ), Sensei Faisal Almuslem 4 Dan Shidokan-Jitsu, AJJIF Member ( Kuwait ), Sensei Omair Alajmi 1 Dan Shidokan-Jitsu, AJJIF Member ( Kuwait ). With the Support of the Russian Government, Ministry of Sports & Education of Russia, State and City Officials. Russian National TV and Press Coverage. Organized and Hosted by AJJIF RUSSIA. Sanctioned by AJJIF GLOBAL - ALL JAPAN JU-JITSU INTERNATIONAL FEDERATION and KATABAMI JU-JITSU CLAN. International Katabami Ju-Jitsu & Karate Seminar with O-Sensei Alexey Kunin 10 Dan Ju-Jitsu ( USA ), Founder & President of the AJJIF GLOBAL, Headmaster / Head Family of Katabami Ju-Jitsu Clan, Shihan Ionel Bara 7 Dan Okinawa Karate, AJJIF Vice President, President of WTFSKF, Member of Katabami Ju-Jitsu Clan, Shihan Pavel Milovan 8 Dan Ju-Jitsu, AJJIF Representative ( Romania ), Shihan Michael Bock 7 Dan Shotokan Karate, AJJIF Representative ( Germany ), President of German Martial Arts Organization, Member of Katabami Ju-Jitsu Clan, Shihan Dariusz Bajkovski 7 Dan Fudokan Karate, AJJIF Representative ( Poland ), President of Polish Karate Association. With the support of Local Politicians and Government Officials. Romanian National TV and Press & Media Coverage. 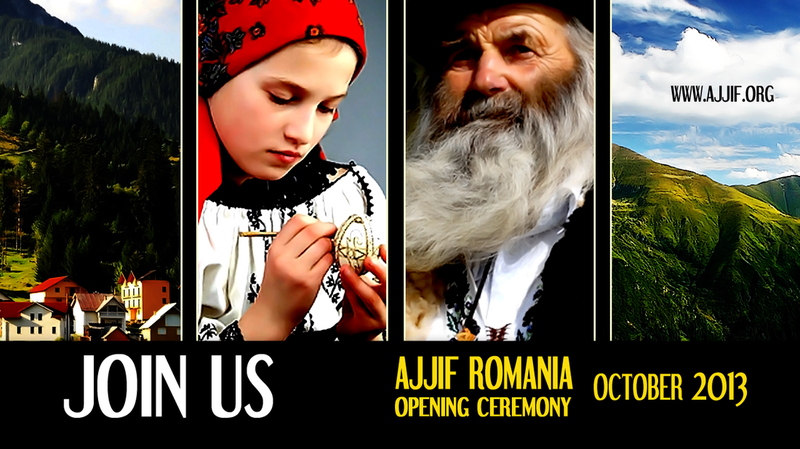 Organized and Hosted by WTFSKF ( World Karate Governing Body ) and AJJIF ROMANIA. Sanctioned by AJJIF GLOBAL - ALL JAPAN JU-JITSU INTERNATIONAL FEDERATION and KATABAMI JU-JITSU CLAN. International Katabami Ju-Jitsu Seminar with O-Sensei Alexey Kunin 10 Dan Ju-Jitsu ( USA ), Founder & President of the AJJIF GLOBAL, Headmaster / Head Family of Katabami Ju-Jitsu Clan, Kaicho Dr. Mohsen Terkawi 7 Dan Shidokan-Jitsu, AJJIF Representative in the Middle East, Member of Katabami Ju-Jitsu Clan. With the support of Local Politicians and Government Officials, Police and Military. Kuwait National TV and Press & Media Coverage. Organized and Hosted by AJJIF KUWAIT. Sanctioned by AJJIF GLOBAL - ALL JAPAN JU-JITSU INTERNATIONAL FEDERATION and KATABAMI JU-JITSU CLAN. O-Sensei Alexey Kunin 10 Dan Ju-Jitsu ( USA ), Founder & President of the AJJIF GLOBAL, Headmaster / Head Family of Katabami Ju-Jitsu Clan, Hanshi Yury Smirnov 8 Dan Ju-Jitsu, AJJIF Representative ( Russia ), Member of Katabami Ju-Jitsu Clan, Mr. Made Dana Tangkas, AJJIF Indonesia President, Hanshi Heru Nurcahyo 10 Dan Ju-Jitsu, AJJIF Indonesia Vice President, Member of Katabami Ju-Jitsu Clan, Shihan Heru Winoto 8 Dan Ju-Jitsu, AJJIF Member ( Indonesia ), Member of Katabami Ju-Jitsu Clan, Shihan Ali Akbar Hehaitu 6 Dan Ju-Jitsu, AJJIF Member ( Indonesia ), Member of Katabami Ju-Jitsu Clan, Shihan Dedy Triharjanto 6 Dan Ju-Jitsu, AJJIF Member ( Indonesia ), Member of Katabami Ju-Jitsu Clan. 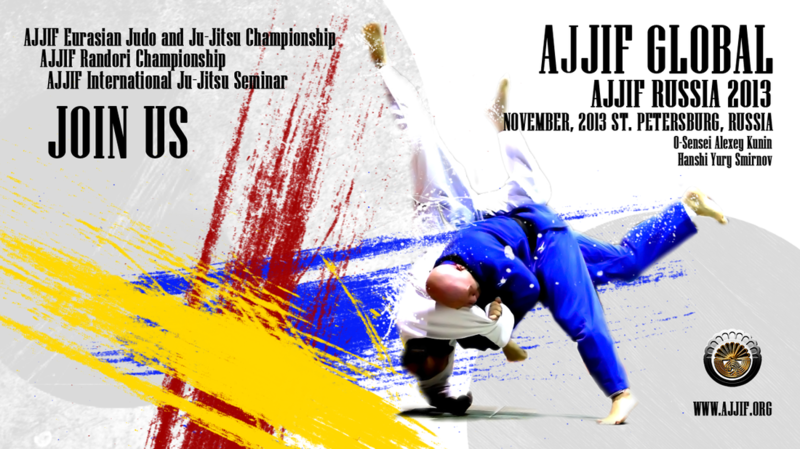 Organized by AJJIF INDONESIA, IJI - Institute Ju-Jitsu Indonesia. Supported by Japanese Government, Japan Foundation ( Japan Foundation is a Japanese Government Educational Organization under the Japanese Ministry of Foreign Affairs ), Indonesian Government, Ministry of Sports of Indonesia. With Indonesian National TV and Press & Media Complete Coverage. Sponsored by Toyota and Honda Motors Corporations. Organized and Hosted by AJJIF INDONESIA. Sanctioned by AJJIF GLOBAL - ALL JAPAN JU-JITSU INTERNATIONAL FEDERATION and Katabami Ju-Jitsu Clan﻿. O-Sensei Alexey Kunin 10 Dan Ju-Jitsu ( USA ), Founder & President of the AJJIF GLOBAL, Headmaster / Head Family of Katabami Ju-Jitsu Clan, Hanshi Toney Raven 10 Dan Ju-Jitsu, 10 Dan Judo, AJJIF Senior Vice President, Member of Katabami Ju-Jitsu Clan, Shihan Tony Calvino 8 Dan Karate, 7 Dan Ju-Jitsu, AJJIF Representative ( Cuba ), Member of Katabami Ju-Jitsu Clan, Shihan Michael Verdugo 6 Dan Judo, 6 Dan Ju-Jitsu, AJJIF Director, AJJIF Member ( USA ),﻿ ﻿Member of Katabami Ju-Jitsu Clan, Shihan Olga Kunin 6 Dan Ju-Jitsu, AJJIF General Secretary, AJJIF Member ( USA ), Master Instructor of Katabami Ryu Ju-Jitsu, Member of Katabami Ju-Jitsu Clan. Organized and Hosted by AJJIF USA. Sanctioned by AJJIF GLOBAL - ALL JAPAN JU-JITSU INTERNATIONAL FEDERATION and KATABAMI JU-JITSU CLAN. 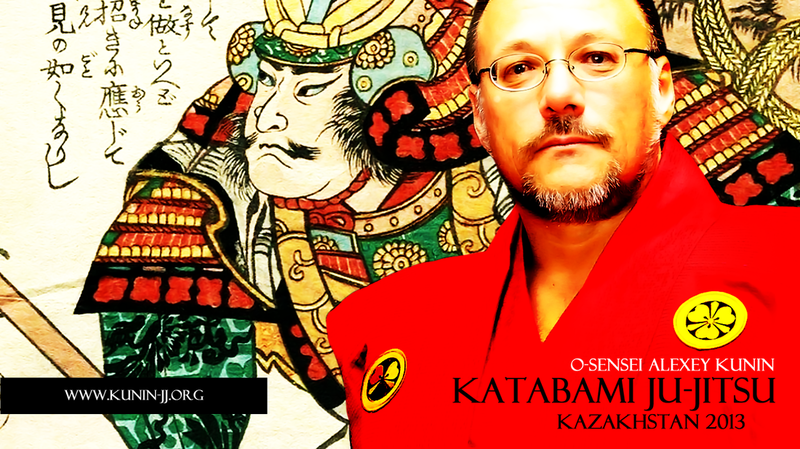 O-Sensei Alexey Kunin 10 Dan Ju-Jitsu ( USA ), Founder & President of AJJIF GLOBAL, Headmaster / Head Family of Katabami Ju-Jitsu Clan. With the support of the Australian Government, State and City Officials. Organized and Hosted by AJJIF AUSTRALIA. Sanctioned by AJJIF GLOBAL - ALL JAPAN JU-JITSU INTERNATIONAL FEDERATION and KATABAMI JU-JITSU CLAN﻿. Martial Arts Demonstration by Katabami Ju-Jitsu and Pasadena Kodokan Judo. With O-Sensei Alexey Kunin 10 Dan Ju-Jitsu ( USA ), Founder & President of the AJJIF GLOBAL, Headmaster / Head Family of Katabami Ju-Jitsu Clan, Shihan Tony Calvino 8 Dan Karate, 7 Dan Ju-Jitsu, AJJIF Representative ( Cuba ), Member of Katabami Ju-Jitsu Clan, Shihan Olga Kunin 6 Dan Ju-Jitsu, AJJIF General Secretary, AJJIF Member ( USA ), Master Instructor of Katabami Ryu Ju-Jitsu, Member of Katabami Ju-Jitsu Clan. Supported by the Japanese Community of Los Angeles. Sanctioned by AJJIF GLOBAL - ALL JAPAN JU-JITSU INTERNATIONAL FEDERATION and KATABAMI JU-JITSU CLAN. O-Sensei Alexey Kunin 10 Dan Ju-Jitsu ( USA ), Founder & President of the AJJIF GLOBAL, Headmaster / Head Family of Katabami Ju-Jitsu Clan, Hanshi Toney Raven 10 Dan Ju-Jitsu, 10 Dan Judo, AJJIF Senior Vice President, Member of Katabami Ju-Jitsu Clan, Shihan Nori Bunasawa 10 Dan Ju-Jitsu, 8 Dan Kodokan Judo, AJJIF Representative ( Japan ), Member of Katabami Ju-Jitsu Clan, Shihan Gary Goltz 8 Dan Judo, 8 Dan Ju-Jitsu, AJJIF Director, AJJIF Member ( USA ), President of USJA, Shihan Tony Calvino 8 Dan Karate, 7 Dan Ju-Jitsu, AJJIF Representative ( Cuba ), Member of Katabami Ju-Jitsu Clan,﻿ Hanshi Yury Smirnov 8 Dan Ju-Jitsu, 7 Dan Judo, 6 Dan Shotokan Karate, AJJIF Representative ( Russia ), Member of Katabami Ju-Jitsu Clan﻿, Shihan Boris Brezhnev 7 Dan Judo, 6 Dan Ju-Jitsu, AJJIF Representative Sambo ( USA ), AJJIF Member ( USA ), Shihan Michael Verdugo 6 Dan Judo, 6 Dan Ju-Jitsu, AJJIF Director, AJJIF Member ( USA ),﻿ ﻿Member of Katabami Ju-Jitsu Clan, ﻿Shihan Olga Kunin 6 Dan Ju-Jitsu, AJJIF General Secretary, AJJIF Member ( USA ), Master Instructor of Katabami Ryu Ju-Jitsu, Member of Katabami Ju-Jitsu Clan, Renshi Rebecca Greenough 5 Dan Karate, AJJIF Member ( USA ). Organized and Hosted by AJJIF USA. Sanctioned by AJJIF GLOBAL - ALL JAPAN JU-JITSU INTERNATIONAL FEDERATION and KATABAMI JU-JITSU CLAN. O-Sensei Alexey Kunin 10 Dan Ju-Jitsu ( USA ), Founder / President of AJJIF GLOBAL, Headmaster / Head Family of Katabami Ju-Jitsu Clan, Shihan Michael Bock, AJJIF Representative ( Germany ), President of German Martial Arts Organization, 7 Dan Combat Karate, 6 Dan Ju-Jitsu, 6 Dan Shotokan Karate, 6 Dan Judo, Member of Katabami Ju-Jitsu Clan, Sensei Kurt Steube 7 Dan Ju-Jitsu, AJJIF Member ( Germany ). With the support of Local Politicians and Government Officials. Press and Media Coverage. Organized and Hosted by AJJIF GERMANY. Sanctioned by AJJIF GLOBAL - ALL JAPAN JU-JITSU INTERNATIONAL FEDERATION and KATABAMI JU-JITSU CLAN. O-Sensei Alexey Kunin 10 Dan Ju-Jitsu ( USA ), Founder & President of AJJIF GLOBAL, Headmaster / Head Family of Katabami Ju-Jitsu Clan, Hanshi Yury Smirnov 8 Dan Ju-Jitsu, 7 Dan Judo, 6 Dan Shotokan Karate, AJJIF Representative ( Russia ), Member of Katabami Ju-Jitsu Clan, Hanshi Ruslan Abdreyev 8 Dan Ju-Jitsu, AJJIF Representative ( Kazakhstan ), Member of Katabami Ju-Jitsu Clan, Sensei Thomas Starling 7 Dan Ju-Jitsu, AJJIF Member ( UK ), Renshi Bayan Zhangalov 5 Dan Ju-Jitsu, AJJIF Member ( Kazakhstan ), Sensei Leif Ager 3 Dan Shotokan Karate, AJJIF Representative ( Denmark ), Member of Katabami Ju-Jitsu Clan. Organized and Hosted by AJJIF DENMARK. Sanctioned by AJJIF GLOBAL - ALL JAPAN JU-JITSU INTERNATIONAL FEDERATION and KATABAMI JU-JITSU CLAN. O-Sensei Alexey Kunin 10 Dan Ju-Jitsu ( USA ), Founder & President of the AJJIF GLOBAL, Headmaster / Head Family of Katabami Ju-Jitsu Clan.﻿ With the National TV Coverage and Media & Press Conference. This International Event is Registered and Recognized by the Ministry of Sports and Government of Mexico. Organized and Hosted by AJJIF MEXICO.﻿﻿ Sanctioned by AJJIF GLOBAL - ALL JAPAN JU-JITSU INTERNATIONAL FEDERATION and KATABAMI JU-JITSU CLAN. 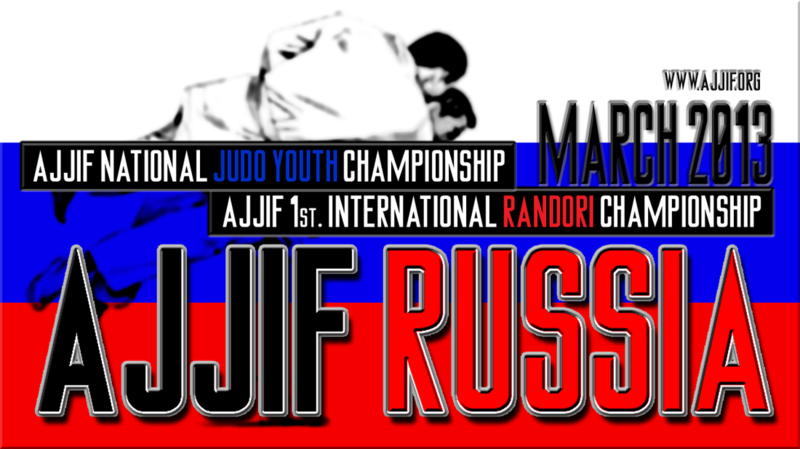 AJJIF III EURASIAN Ju-Jitsu Forum. 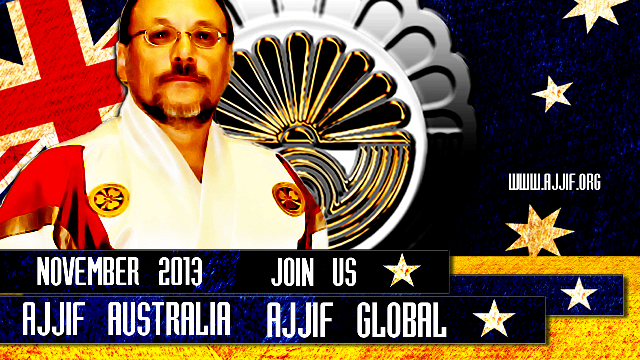 AJJIF GLOBAL International Ju-Jitsu Accreditation Program for National Federations. International Referee Accreditation Seminar. 1st. Time in the History of Kazakhstan, Special Exclusive and Historic Presentation of Ancient Katabami Ju-Jitsu Clan Lineage Scroll﻿. With O-Sensei Alexey Kunin 10 Dan Ju-Jitsu ( USA ), Founder & President of the AJJIF GLOBAL, Headmaster / Head Family of Katabami Ju-Jitsu Clan, Mr. Erlan Karin - President of Jiu-Jitsu Federation of Kazakhstan, AJJIF Representative ( Kazakhstan ), Hanshi Ruslan Abdreyev 8 Dan Ju-Jitsu, AJJIF Member ( Kazakhstan ), Member of Katabami Ju-Jitsu Clan, Hanshi Yury Smirnov 8 Dan Ju-Jitsu, 7 Dan Judo, 6 Dan Shotokan Karate, AJJIF Representative ( Russia ), Member of Katabami Ju-Jitsu Clan. With the National TV Coverage and Press Conference. This International Event is Registered and Recognized by the Ministry of Sports and Government of Kazakhstan. Organized and Hosted by AJJIF KAZAKHSTAN. Sanctioned by Presidential Political Party of Nazarbaeva and AJJIF GLOBAL - ALL JAPAN JU-JITSU INTERNATIONAL FEDERATION and KATABAMI JU-JITSU CLAN﻿. O-Sensei Alexey Kunin 10 Dan Ju-Jitsu ( USA ), Founder & President of the AJJIF GLOBAL, Headmaster / Head Family of Katabami Ju-Jitsu Clan, O-Sensei Hal Sharp 10 Dan Judo, AJJIF Judo Legend, AJJIF Senior Technical Adviser,﻿ Hanshi Toney Raven 10 Dan Ju-Jitsu, 10 Dan Judo, AJJIF Senior Vice President, Member of Katabami Ju-Jitsu Clan, Shihan Gary Goltz 8 Dan Judo, 8 Dan Ju-Jitsu, AJJIF Member ( USA ), President of USJA,﻿ Shihan Tony Calvino 8 Dan Karate, 7 Dan Ju-Jitsu, AJJIF Representative ( Cuba ), Member of Katabami Ju-Jitsu Clan,﻿ Shihan Boris Brezhnev 7 Dan Judo, 6 Dan Ju-Jitsu, AJJIF Representative Sambo ( USA ), AJJIF Member ( USA ), USA Sambo National Coach, Vice President of American Amateur Sambo Federation, Sensei Alfred Urquidez 9 Dan Kajukenbo, 9 Dan Kenpo, AJJIF Member ( USA )﻿, ﻿Shihan Michael Verdugo 6 Dan Judo, 6 Dan Ju-Jitsu, AJJIF Director, AJJIF Member ( USA ),﻿ ﻿Member of Katabami Ju-Jitsu Clan, ﻿Sensei Low Dong 6 Dan Judo, AJJIF Member ( USA ), Shihan Olga Kunin 6 Dan Ju-Jitsu, AJJIF Member ( USA ), Master Instructor of Katabami Ryu Ju-Jitsu, Member of Katabami Ju-Jitsu Clan, Renshi Rebecca Greenough 5 Dan Karate, AJJIF Member ( USA ).﻿ Organized and Hosted by AJJIF USA. Sanctioned by AJJIF GLOBAL - ALL JAPAN JU-JITSU INTERNATIONAL FEDERATION and KATABAMI JU-JITSU CLAN. O-Sensei Alexey Kunin 10 Dan Ju-Jitsu ( USA ), Founder & President of AJJIF GLOBAL, Headmaster / Head Family of Katabami Ju-Jitsu Clan, Hanshi Toney Raven 10 Dan Ju-Jitsu, 10 Dan Judo, AJJIF Senior Vice President, Member of Katabami Ju-Jitsu Clan, Shihan Michael Verdugo 6 Dan Judo, 6 Dan Ju-Jitsu, AJJIF Member of Board of Directors, AJJIF Member ( USA ),﻿ ﻿Member of Katabami Ju-Jitsu Clan, Shihan Yury Smirnov 7 Dan Ju-Jitsu, 7 Dan Judo, 6 Dan Shotokan Karate, AJJIF Representative ( Russia ), Member of Katabami Ju-Jitsu Clan. With the Support of the Russian Government, Ministry of Sports & Education of Russia, State and City Officials. Russian National TV and Press Coverage and the Japan Foundation ( Japan Foundation is a Japanese Government Educational Organization under the Japanese Ministry of Foreign Affairs ). Organized and Hosted by AJJIF RUSSIA. Sanctioned by AJJIF GLOBAL - ALL JAPAN JU-JITSU INTERNATIONAL FEDERATION and KATABAMI JU-JITSU CLAN. 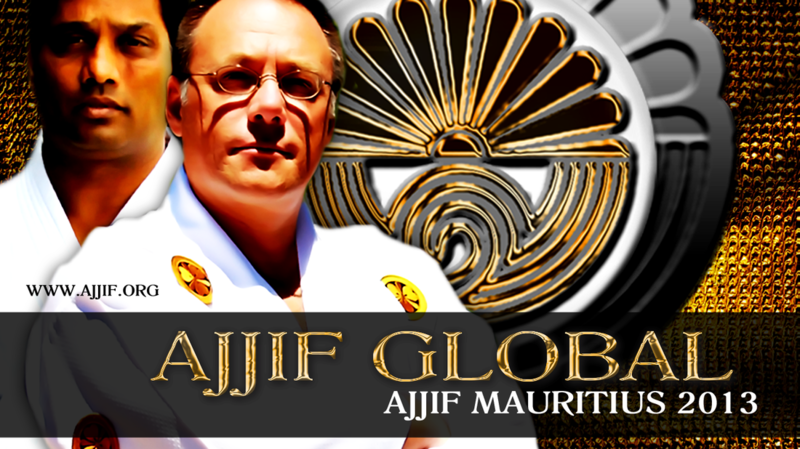 O-Sensei Alexey Kunin 10 Dan Ju-Jitsu ( USA ), Founder & President of AJJIF GLOBAL, Headmaster / Head Family of Katabami Ju-Jitsu Clan, Hanshi Sorab Mowlabucus, 8 Dan Ju-Jitsu, AJJIF Representative ( Mauritius ), AJJIF Secretary Indian Ocean. 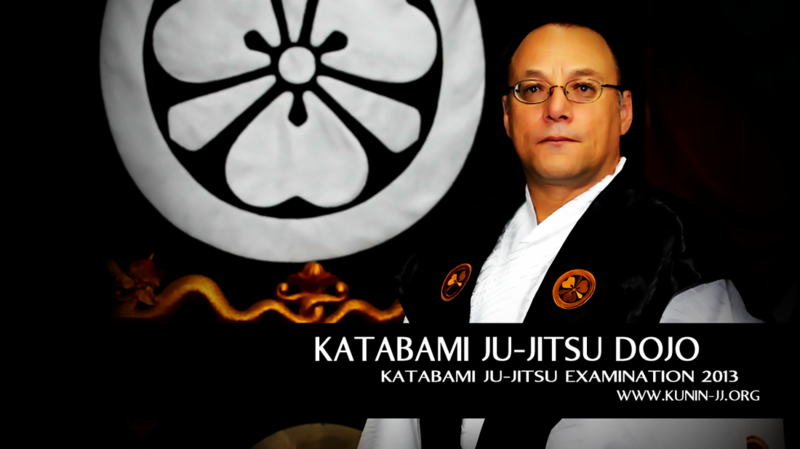 Member of Katabami Ju-Jitsu Clan. This International Event is Registered and Recognized by the Ministry of Sports of Mauritius. With the National TV Coverage and Media & Press Conference. Supported by the Japan Foundation ( Japan Foundation is a Japanese Government Educational Organization under the Japanese Ministry of Foreign Affairs ).﻿ Organized by the International Ju-Jitsu Academy, Ju-Jitsu Council of Mauritius. Organized and Hosted by AJJIF MAURITIUS. Sanctioned by AJJIF GLOBAL - ALL JAPAN JU-JITSU INTERNATIONAL FEDERATION and KATABAMI JU-JITSU CLAN. AJJIF GLOBAL SAMBO DIVISION OPENING CEREMONY. O-Sensei Alexey Kunin 10 Dan Ju-Jitsu ( USA ), Founder & President of the AJJIF GLOBAL, Headmaster / Head Family of Katabami Ju-Jitsu Clan, Soke Rigoberto Lopez 10 Dan Kung Do Lama, AJJIF Representative ( Mexico ), Member of Katabami Ju-Jitsu Clan, Grandmaster Gokor Chivichyan, AJJIF Member ( USA ), Shihan Veronica Lopez 7 Dan Kung Do Lama, AJJIF Member ( Mexico ), Member of Katabami Ju-Jitsu Clan, Shihan Tony Calvino 8 Dan Karate, 7 Dan Ju-Jitsu, AJJIF Representative ( Cuba ), Member of Katabami Ju-Jitsu Clan, Shihan Michael Verdugo 6 Dan Judo, 6 Dan Ju-Jitsu, AJJIF Member of Board of Directors, AJJIF Member ( USA ), Sensei Boris Brezhnev 7 Dan Judo, 6 Dan Ju-Jitsu, AJJIF Representative Sambo ( USA ), AJJIF Member ( USA ), USA Sambo National Coach, Vice President of American Amateur Sambo Federation, Renshi Rebecca Greenough 5 Dan Shorinjiryu Karate, AJJIF Member ( USA ), Media and TV coverage. 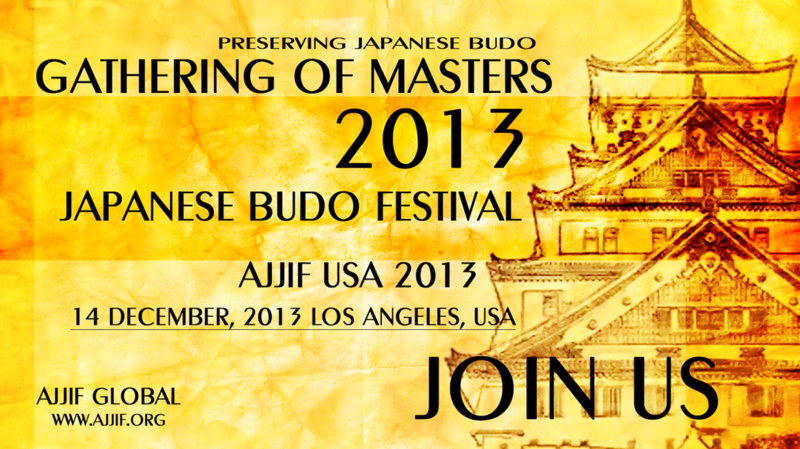 Supported by the Japanese Community of Los Angeles and Japan Foundation. Organized and Hosted by AJJIF USA. Sanctioned by AJJIF GLOBAL - ALL JAPAN JU-JITSU INTERNATIONAL FEDERATION and KATABAMI JU-JITSU CLAN. O-Sensei Alexey Kunin 10 Dan Ju-Jitsu ( USA ), Founder & President of the AJJIF GLOBAL, Headmaster / Head Family of Katabami Ju-Jitsu Clan, Shihan Olga Kunin 6 Dan Ju-Jitsu ( USA ), Master Instructor of Katabami Ryu Ju-Jitsu, Member of Katabami Ju-Jitsu Clan. Organized and Hosted by AJJIF USA. Sanctioned by AJJIF GLOBAL - ALL JAPAN JU-JITSU INTERNATIONAL FEDERATION and KATABAMI JU-JITSU CLAN. O-Sensei Alexey Kunin 10 Dan Ju-Jitsu ( USA ), Founder & President of the AJJIF GLOBAL, Headmaster / Head Family of Katabami Ju-Jitsu Clan, Sensei Boris Brezhnev 6 Dan Judo, 6 Dan Ju-Jitsu, USA Sambo National Coach, Vice President of American Amateur Sambo Federation, AJJIF Member ( USA ), Sensei Justin Brezhnev 2 Dan Ju-Jitsu. Organized and Hosted by AJJIF USA. Sanctioned by AJJIF GLOBAL - ALL JAPAN JU-JITSU INTERNATIONAL FEDERATION and KATABAMI JU-JITSU CLAN. O-Sensei Alexey Kunin 10 Dan Ju-Jitsu ( USA ), Founder & President of AJJIF GLOBAL, Headmaster / Head Family of Katabami Ju-Jitsu Clan, Master Abderrahim Mazouzi 8 Dan Daito Ryu Aikijutsu, AJJIF Representative Aikijutsu ( Morocco ), Master Mehdi Hijaouy 7 Dan Atemi Ryu Jujitsu, 7 Dan Daito Ryu Aikijutsu, AJJIF Representative Ju-Jitsu ( Morocco ), Member of Katabami Ju-Jitsu Clan, Sensei Sidi El Ghali Elamrani 5 Dan Atemi Ryu Jujitsu, AJJIF Member ( Morocco ), Sensei Sidi Mohamed Amine El Idrissi 5 Dan Atemi Ryu Jujitsu, AJJIF Member ( Morocco ). With the Moroccan National TV Coverage. Sanctioned by AJJIF GLOBAL - ALL JAPAN JU-JITSU INTERNATIONAL FEDERATION and KATABAMI JU-JITSU CLAN. Organized and Hosted by AJJIF MOROCCO.